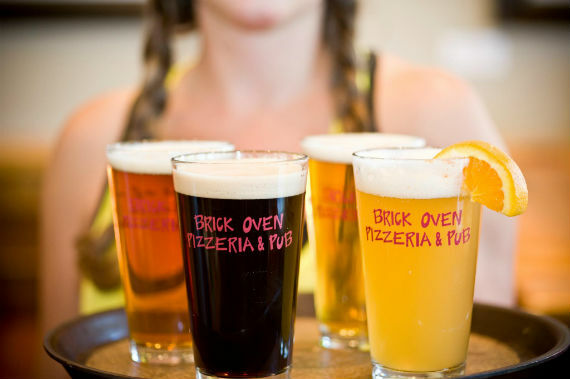 Brick Oven Pizzeria and Pub boasts the largest patio in town and offers 30 beers on tap, full-bar, pizza, and salad bar. Join us for daily beer and food specials. Enjoy! "Join our team today! If you're looking for more information or hoping to pick up an application, just give us a call or stop by. " "There's always something new to try -- take it from the experts. https://www.yelp.com/biz/brick-oven-pizzeria-and-pub-crested-butte"
"No time for a weekend getaway? Just catch a flight instead." "30 beers on tap, a full bar, handcrafted pizzas and pub food, the largest patio in town, and breathtaking mountain views are all found here!" Pizza is ready to go at lunch time! Good menu selection with 30 beers on tap, some on special. We went early between 2and3 pm and got seated easily. Also, went a separate time just for a drink and sat at the bar. Yes, I'd like to receive news from Brick Oven Pizzeria and Pub. Sign up for the Brick Oven Pizzeria and Pub Newsletter!